This lesson is a continuation of the same technical concept behind the sweep picking Pentatonic Minor/Blues scale lesson I posted earlier. If you like this approach, you may like that lesson as well (links at the bottom of the page). Today I have not one but TWO licks that go together like peanut butter and an ashtray. 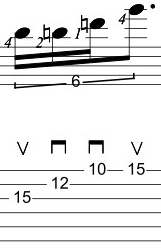 Both of these are transitional licks leading back into key of G (The bluegrassiest of all keys) and while they probably won’t get you beat up (hence the black and bluegrass) or kicked out of a session – they might turn a head or two! Now, let me explain a little about what going on here. 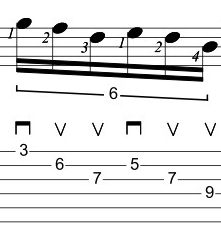 This is a transitional lick that resolves to G that uses different G-based chords starting from G, Bb and Db (aka G diminished). The spread wasn’t an easy one to get in to or out of cleanly. So I cheated it and used the D instead, grabbing the E on the B string keeping the D and adding a B on the D-string. 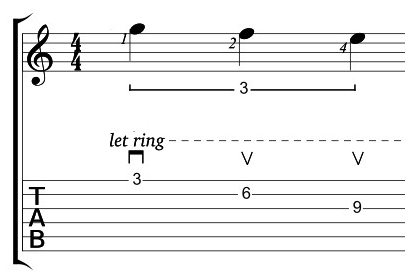 If you remove the E, you have a nice voicing for a G7 chord starting from the 3rd, but for melodic playing it’s easier to arpeggiate the chord as 3 note groups. 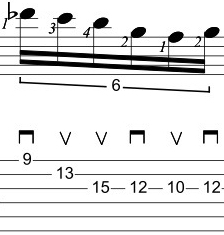 Then the lick jumps from the D to Db to start the G min7b5 (add11) arpeggio. That might sound exotic – but it’s just 4 notes from the G Blues scale (G, Bb, C, Db and F). Finally, it ends up with a G major triad with an added b3rd (a useful bluegrass cliché. For even more of a bluegrass sound, add the E on the 12th fret E string between the D and the G). 1. 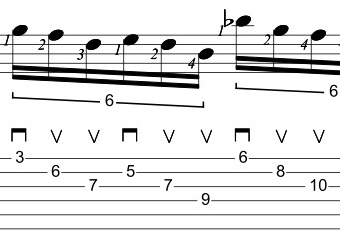 As with the sweep picking blues pentatonic lesson, keeping the notes staccato (i.e. taking the finger pressure off the string after each note is played) will help with articulation. 2. 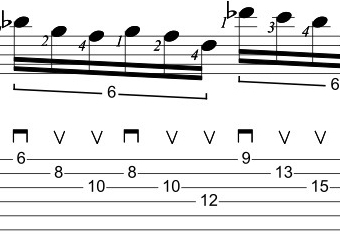 The biggest challenge with this lick will probably be taming the open D string when you switch from the 3-string D-G-B pattern back to the top three strings. Use pick hand muting to mute the D string once you play the first note on the high E string – and try practicing the lick as 9-note groupings to work that transition. 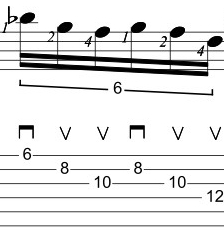 Lick #2 is just silly – but it’s a fun idea and it’s a great way to work on the 3-string picking pattern. 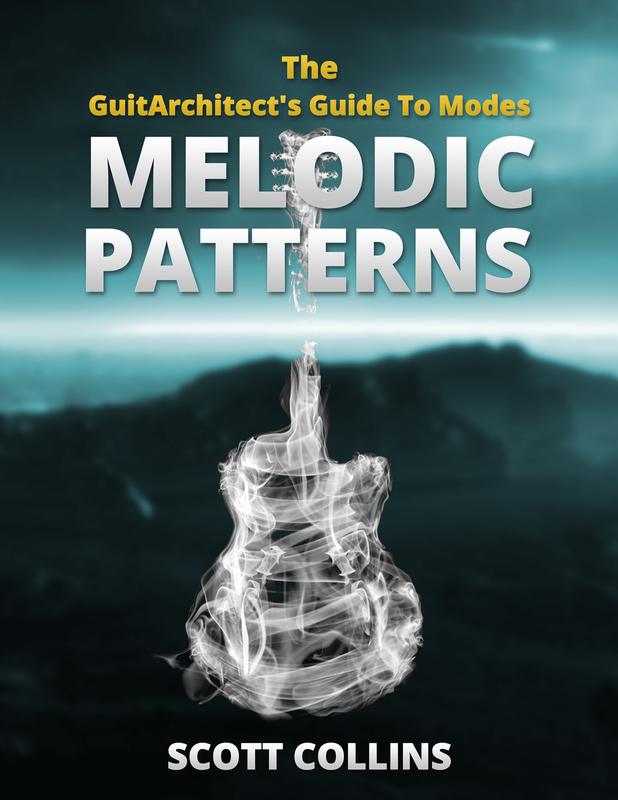 This one-note per string scale idea is taken from the last section of my Melodic Patterns book so if this area interest you, you may want to check that book out. You can find out more about it here. (available on Lulu or on Amazon) has a complete break down of all note-per-string scale variations which include the 2 above. In the meantime, give this approach a try with other scales as well. In the next sweep picking acoustic lesson – I’ll adapt this to a bluegrass lick that you might find cool. This entry was posted in Applied Theory, Lessons, Practicing and tagged Acoustic Sweep picking, Bluegrass licks, Guitarchitecture, GuitArchitecture lesson, Scott Collins Guitar, sweep pick blues, Sweep picking lesson by GuitArchitecture. Bookmark the permalink.